Kindly note that your Coins.ph account must be ID and selfie verified in order to cash out. Step 1: Tap the "Cash Out" Icon on the app. Step 2: Choose the cash out option that is most convenient for you. Step 3: Enter the amount that you want to cash out and tap "Next". Step 4: Enter the recipient's details. Then, scroll down to review the cash out and swipe "Slide to Pay" to successfully place your order. Step 1: Login to your Coins.ph account. Step 2: On the upper part of the page, click on “Cash Out”. Step 4: Enter the amount you’d like to cash out then click “Next Step”. Step 5: Enter the recipient's details. Then, review the cash out and click "Complete Payment" to successfully place your order. For more information on cashing out, click here. 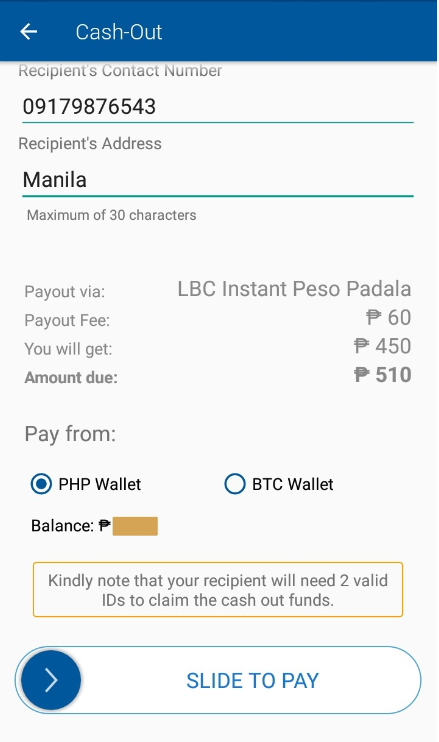 You can also drop us a message at help@coins.ph. Not yet a Coins.ph user? Sign up here.